Definition at line 418 of file dbghelp_private.h. Definition at line 435 of file dbghelp_private.h. Definition at line 434 of file dbghelp_private.h. Definition at line 432 of file dbghelp_private.h. Referenced by dwarf2_location_compute(), SymSetContext(), and symt_enum_locals(). Definition at line 430 of file dbghelp_private.h. Referenced by pe_load_builtin_module(), and SymInitializeW(). Definition at line 421 of file dbghelp_private.h. 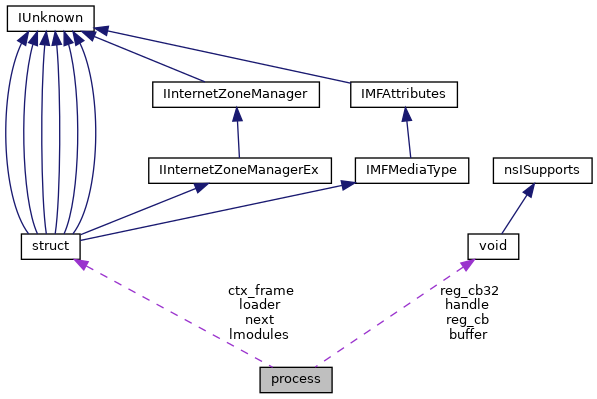 Referenced by check_live_target(), dwarf2_location_compute(), loc_compute_frame(), pcs_callback(), pe_load_builtin_module(), and SymInitializeW(). Definition at line 429 of file dbghelp_private.h. Referenced by module_find_by_addr(), module_find_by_nameW(), module_get_containee(), module_get_container(), module_is_already_loaded(), module_is_container_loaded(), module_new(), module_remove(), SymCleanup(), SymEnumerateModulesW64(), SymFromName(), and SymInitializeW(). Definition at line 420 of file dbghelp_private.h. Referenced by SymCleanup(), SymInitializeW(), and SymSetOptions(). Definition at line 424 of file dbghelp_private.h. Referenced by pcs_callback(), and sym_register_cb(). Definition at line 425 of file dbghelp_private.h. Referenced by reg_cb64to32(), and sym_register_cb(). Definition at line 426 of file dbghelp_private.h. Definition at line 427 of file dbghelp_private.h. Definition at line 422 of file dbghelp_private.h. Referenced by path_find_symbol_file(), pe_load_native_module(), SymFindFileInPathW(), SymGetSearchPathW(), SymInitializeW(), and SymSetSearchPathW().